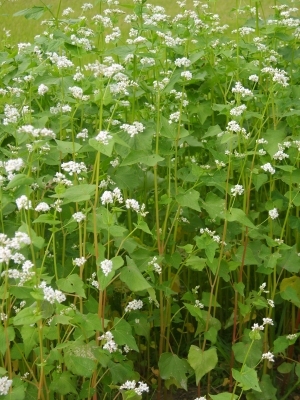 The seed of buckwheat is an important subsistence food in parts of Asia, where the plant has a history of cultivation going back at least 1,000 years. The seed has gained acceptance as a healh food, whilst the plant also has edible leaves, some important traditional medicinal actions and supplies a dye. It is often grown on a garden scale, and also commercially on a small scale, for its edible leaves and seeds, whilst it is also commonly grown as a green manure crop and to restore worn-out soils.. The plant has caused photosensitivity in some people, only the dehusked grain is considered to be safe. Probably originating in China, the plant is cultivated in many temperate areas where it sometimes escapes and is found wild. ]. Its original habitat is obscure. Fresh leaves and inflorescences are used for the industrial extraction of rutin, which is applied to strengthen the inner lining of blood vessels (however, it is rather the related species Fagopyrum tataricum (L.) Gaertn., which is commonly grown for rutin production). Rutin is also industrially used as a natural pigment, antioxidant, stabilizer, food preservant and absorber of UV light.